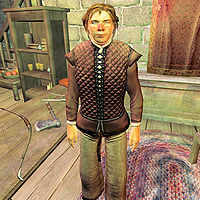 Gunder is a Nord trader and the proprietor of Colovian Traders in Skingrad. Gunder sells general goods, upgrades to your luxurious Skingrad house, and the unique shirt Vest of the Bard. He is living with the orphaned and much younger Nord, Eyja, at least until you hire her as a housekeeper for Rosethorn Hall. Gunder lives a quiet and busy life and enjoys a good reputation among the Skingrad townsfolk. He wakes up early at 4am and positions himself behind the counter in the main trading room on the ground floor. At 8am he unlocks the door and spends the next twelve hours offering his services to the occasional customer. After closing up shop at 8pm, he spends another two hours behind the counter, until he heads upstairs and finds his bed at 10pm. He wears a typical set of middle-class clothing, a quilted doublet paired with light brown linens and doeskin shoes. He only carries his key and a small amount of gold. When you approach him for the first time, he will give you a warm welcome to his shop: "Welcome to Colovian Traders, Skingrad's finest selection of general merchandise. I'm Gunder. Just let me know what you want." When asked about Skingrad, he will comment: "I like Skingrad just fine. Folks are a little quiet by Skyrim standards, but they're friendly and loyal when they get to know you." All over Skingrad, the citizens are satisfied with Gunder and Colovian Traders: "I've bought a good number of things at Colovian Traders. And Gunder is a friendly sort. ", "I need to head over to Colovian Traders and pick up a few things from Gunder. He's got a nice selection. ", "Colovian Traders is a good shop. Perhaps I'll visit Gunder soon." and "I've bought a number of things from Gunder. I've always been satisfied." Eyja, on the other hand, will tell you about Gunder with a touch of bitterness: "Gunder took me in when I was but a teen, and I've lived there ever since. We've... shared a bed... but were never married. He's never been cruel to me, it's just that he's never been kind. It's as if I'm just another part of his shop." Finally, after you have purchased your new home in town, Orc butler Shum gro-Yarug will point you towards Gunder with the words: "If you head to Colovian Traders, Gunder can provide all sorts of great furnishings for your new home. Good luck!" This page was last modified on 12 July 2018, at 21:48.